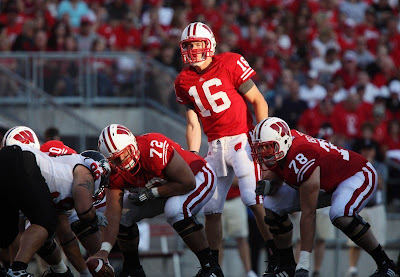 The Wisconsin Badgers opened their 2009 campaign against Northern Illinois on Saturday. The Badgers won, 28-20, dominating NIU through three quarters but had to hold on for the victory after the Huskies scored 14 in the fourth and had the ball with a chance to tie. Here's our grades for the Badgers season opener. Scott Tolzien looked good from the start, hitting Isaac Anderson for an 80-yard touchdown pass on the Badger's first play from scrimmage. He finished the game 15-20 for 257 yards and one touchdown. He also threw a pair of costly interceptions that helped Northern get back in the game. As a passer he looked good, mostly making the smart throw but his mobility could be a concern. Backup QB Curt Phillips was as advertised as well. He threw the ball alright but he really impressed with his mobility. Phillips had four rushes for 43 yards and flashed his ability on a 20-yard dash. It was a good performance by the QB's and they really won the game for Wisconsin, but if they have to be the playmakers it'll be a long season. Zach Brown showed good acceleration and a nice burst through the line, but he doesn't have the size and power to be an effective between the tackles runner. Brown had 51 yards on 14 carries but never really got into any sort of a rhythm. The much hyped John Clay was equally ineffective, although he showed his power as a runner with two 1-yard touchdown runs. Clay looks a lot like a Ron Dayne type of back that can be more and more effective as the game goes on. Overall the roles for these two backs seem undefined. Brown should be considered a change of pace back, with plays that maximize his quickness and speed and Clay should be receiving the majority of carries. In game one though, that was not the case. Senior Tight End Garret Graham was as advertised, with six catches for 82 yards. It will be important for him to continue to be a go-to target for Tolzien and Phillips. A pair of wide receivers looked very good as well. Isaac Anderson showed his big play potential with the 80 yard TD on play one and a 23 reverse for a TD. Nick Toon has the size and speed to be one of the better receivers in Wisconsin history, he's only scratched the surface of his ability. The pass protection was very good from a unit with major injury problems before the game, a freshman (Travis Frederick) started at Center for Bucky. Tolzien had pretty good protection when he was throwing the ball, but this unit will be tested next week against Fresno State. Also the run blocking was not very good. Part of the reason that Brown and Clay struggled was the lack of running lanes, improvement will be needed. O'Brien Schofield and J.J. Watt were terrific, but the rest of the D-line rotation was spotty at best. Schofield was a difference maker from the end position, most notably on a missed call by the referees (a goal line fumble that Schofield forced and recovered was ruled down by contact and not reviewable). As the game went on though, the lack of depth on the line showed through. Getting Louis Nzegwu and Brendan Kelly back healthy should help, but once again, D-Line depth looks like a problem for the UW. How about Mike Taylor? 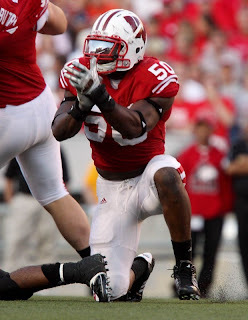 If he can stay on the field he can be a very dynamic player for Bucky. Taylor forced a fumble and seemed to be around the ball on every play. Another Linebacker who was consistently around the ball was Jaevery McFadden. His speed and athleticism will serve him very well once Big Ten play starts. But McFadden also had a very costly facemasking penalty called against him that led to points for NIU. Safety play was terrific. Chris Maragos was flying around the field, leading the team in tackles and recording a sack. He also had two tackles for loss and broke up the fourth down pass on Northern Illinois final drive. Between him and Jay Valai the safety position isn't of great concern for Wisconsin. Cornerback on the other hand, is a different story. Aaron Henry looked good at times but he also looked very, very bad at times. He had a pass interference call that kept a scoring drive alive. Coverage by the corners will have to improve for the Badgers to have a good season. Phillip Welch missed both of his field goal attempts from 41 yards and 55 yards. Don't expect this to be a regular occurrence this season, Welch is a good kicker. Coaches will say "a win is a win," and they did win so there's that. But the running game was not as effective as it needs to be, and the defense wore down severely in the fourth quarter. Quarterback play was as good as could be realistically expected and, more importantly, shows promise and potential. Depth on the defensive line looks like it will be a problem yet again, someone else in that rotation will have to step up. This is a young team, so expectations should be tempered but the potential is there.